Description: Cap: 2 to 12 cm, convex to flat or slightly depressed, off-white, beige to straw, slightly greasy when fresh to smooth when dry, inrolled to wavy, slightly striate; gills: close, white to slightly cream, decurrent; flesh: white, firm; stem: 1 to 7 cm by 1 to 2 cm, offset to nearly central; odor: distinctive (see Notes); taste: mild; spore print: whitish, grayish or lilac. Habitat: Most of the field guides say spring-summer on conifers in Western U.S. and summer-fall on hardwoods in Eastern U.S. It is found in the Pacific Northwest in the spring on alder. Edibility: Choice. A bit more flavor than its fall cousin. Notes: This is a close cousin of our Pacific Northwest fall oyster mushroom – P. ostreatus. P. populinus is another close cousin that grows only on cottonwood/aspen. All are great edibles, and have the unique ‘oyster mushroom’ odor. A circular definition, but easy to remember once experienced, even from cultivated forms. 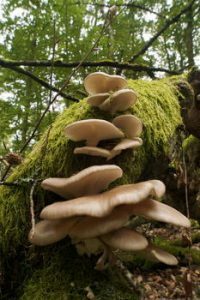 Medical studies of oyster mushrooms show promise for treatments of certain cancers, diabetes, hay fever and pain. Extracts show both antimicrobial and antioxidant properties. Cut small slice off bottom of the squash halves to prevent rocking later. Brush inside & cut faces with olive olive oil and season with salt and pepper. Place face down on a cookie sheet and bake about 45 minutes or until soft. Meanwhile, bring the stock to a boil in a small pot. Add the bulgur, reduce to a simmer, cover and cook 15 minutes. Heat a large skillet over medium high heat. Saute the oyster mushrooms in two batches so they will brown. Cook each batch until no liquid remains. Reduce heat to medium, add both batches back to the pan along with the garlic, rosemary, plus salt and pepper. Saute another few minutes without browning the garlic. Add vermouth and remove from heat. Fluff the bulgur with a fork, stir into the mushroom mixture, add parsley, and stir together. Spoon mushroom/bulgur mix into squash halves. Top with mixed cheeses and bake for another 15-20 minutes. Briefly turn oven to broil to brown lightly. Serve immediately.